Buehler Wants Gov. Brown To Fire Education Leader — But Which One? 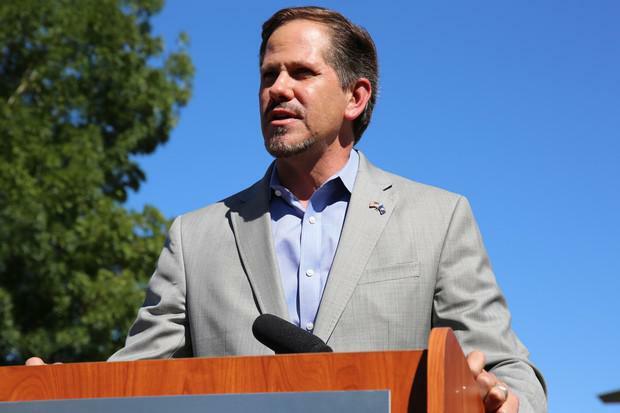 The Republican candidate for Oregon governor, Rep. Knute Buehler, called Friday for a shake-up in leadership at the state’s troubled public school system. But in accusing Gov. Kate Brown of failing to adequately lead Oregon's public schools, Buehler suggested a misunderstanding of who does what job at the top of the state's education bureaucracy. He objected to what he called a “tepid” response from top officials to disappointing test scores. Average Oregon scores have barely budged, and the results continue to reflect large numbers of students falling short of academic benchmarks, including huge gaps based on race and income. In a press conference carried on Facebook Live, Buehler pressed his Democratic opponent to fire a top education leader. “It’s time for Gov. Brown to show leadership," he said. "I’m asking for Gov. Brown immediately to fire Colt Gill as her chief education officer and replace Mr. Gill with an education officer who will take this problem on." But Colt Gill is not Oregon’s chief education officer. That title belongs to Lindsay Capps and means he leads the state's entire education continuum from pre-school through higher education. Colt Gill is the deputy superintendent of public instruction, in charge of the Oregon Department of Education. Buehler has said education is his number one priority. Buehler campaign communications director Monica Wroblewski responded to a request for clarification about who exactly the Republican nominee wanted to fire. "Knute’s calling for the firing of Colt Gill who is the deputy superintendent of public education, chief administrative officer of education and director of the Oregon Department of Education," Wroblewski said in an email. "Chief administrative officer of education" is not one of Colt Gill's official titles.